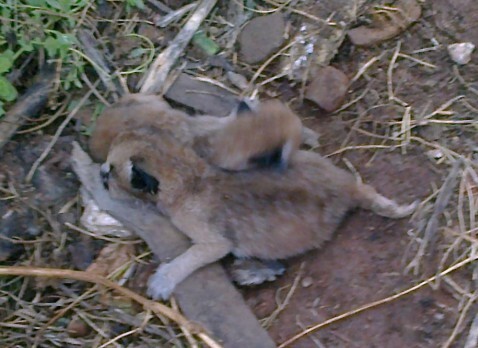 November 5, 2014 – Wonderful news to share, as (DCP) female caracal Lea just now gave birth to 2 healthy cubs, which makes our (WCW) male caracal ambassador Leo a proud daddy, and us all taking part in the caracal conservation project (part of Spotted Cats Conservation, our SA project) very proud and happy too! So far there are 2 healthy cubs and we think there won’t be more on the way, but so far Lea is taking up the mother role excellently as you can see. We are sure both caracals will be proud and well behaved parents, and our caretaker Betty Dorffling will no doubt giving up-dates daily until we can take and share some pics ourselves. 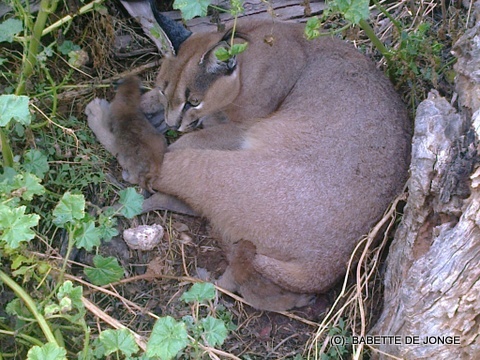 The two cubs will be an important part in our future plans in the caracal conservation project, about which we will inform you more at a later stage. For now let the cubs stay happy and carefree with their parents. The SCC caracal conservation project is a tribute to our first female ambassador Nina whose life was taken in a cruel way. But for now let’s cheer!! !